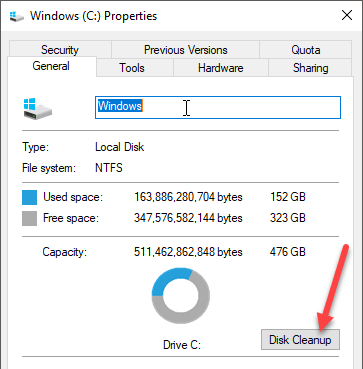 Even though Disk Cleanup is not a very often used tool in Windows, it still does come in handy and I have found that it does a good job of getting rid of some stuff that other cleaners can’t. In Windows 10, you can open Disk Cleanup in a number of ways. In this post, I’ll walk you through the different ways to get to Disk Cleanup. The first way to get to Disk Cleanup is to go to the Control Panel and then open Administrative Tools and click on Disk Cleanup. Pretty straight-forward, but kind of a tedious process. If you happen to be using Windows 8 still, you can read my previous post on how to open the Control Panel in Windows 8 if you’re having trouble doing that. If you really use it a lot, you can right-click on Disk Cleanup in Administrative Tools and choose Pin to Start or Pin to Taskbar. Another way to do this is to open a run dialog and type in the direct executable for disk cleanup. Click on Start, type in run and press Enter. Type in Cleanmgr.exe. 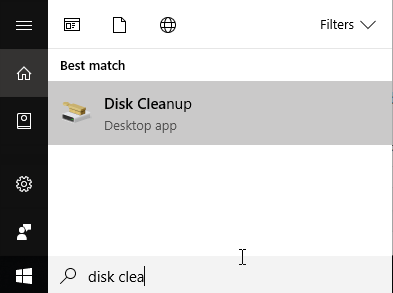 You can also open Explorer, right-click on the drive you want to run Disk Cleanup on and choose Properties. You’ll see the Disk Cleanup button located on the right-hand side down where it shows the capacity of the drive. The easiest way to open Disk Cleanup is to simply click on Start and type in disk cleanup. It should be the first result. If you are using Windows 8, the easiest way to open Disk Cleanup is to open the Charms bar and then click on Search. 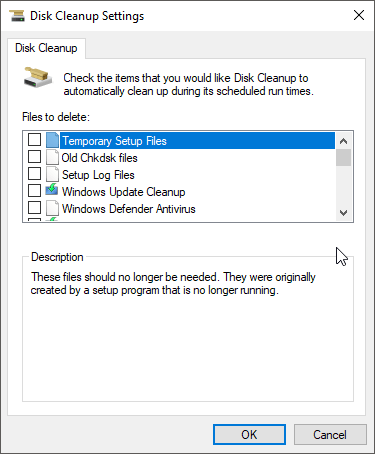 Type in Disk Cleanup and then click on Settings. Click on Free up disk space by deleting unnecessary files. This will bring up Disk Cleanup. Windows 10 also has an extended Disk Cleanup that can be run, which includes more options than what you get in the standard version. Some sites have stated that the extended version is the same as when you click on Clean up system files in the normal Disk Cleanup dialog, but that’s not true. Go ahead and check everything if you like and then click OK. It should definitely clear out more files than it does normally. Obviously, your mileage will vary. The second thing you can do is to open Explorer and type in %temp% into the address bar and manually deleting all the files and folders located there. That’s about all there is to Disk Cleanup. It’s a utility that’s been around for ages in Windows and rightfully so. It does an overall excellent job of cleaning out your hard drive without having to install third-party tools. Enjoy!